Welcome to CORROSION ENTERPRISE CHEMICALS. We are sole distributor of USA Corrosion Technologies LLC in West Africa. Max Wax is the reigning champion! Developed in response to the U.S. military's need for a high tech, dirt and stain repelling coating to protect paint from the ravages of harsh chemicals and jet exhaust, RejeX provides incomparable protection and shine for vehicles of all kinds including: cars and trucks, boats, yachts, military and commercial ships, airplanes and helicopters, motorcycles, RVs, busses, tractors and industrial vehicles. RejeX is also very popular for use on furniture and as a protective sealant for stone counters, shower stalls and glass windows and doors. We sell a complete line of leading edge materials to clean and maintain aviation, marine, automotive, industrial, concrete and asphalt equipment. All products were developed with an eye toward providing top performance from environmentally responsible formulations. Our cleaners, degreasers and coatings were developed not merely to clean, but to also protect equipment from corrosion and the environment in which they operate. No more scraping and painting rusted metal! 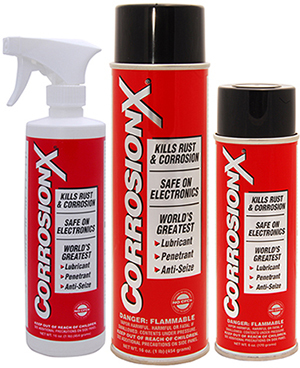 Rust Reconverter LT stops further rust and corrosion on any metal surface by chemically converting rust into a hard, black, organic 'shell' with a clear, acrylic coating. The coating itself is sufficient to last for years, but it is also an excellent primer for latex, epoxy and oil-based paints. 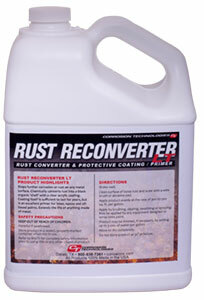 Rust Remover LT extends the life of anything made of metal. Removes rust and leaves a protective primer shell all in one quick and easy step!